After my run in with the bottle of Japanese Pepsi Shiso last year, I've been keeping an eye out for more Japanese Frankenpepsi, and after sadly missing Pepsi Azuki (and not for lack of trying, I can assure you), I've been able to get my hands on Pepsi Baobab. It has a far more attractive label than Pepsi Shiso, in fact, the label is pretty cool. It depicts an African savanna during sunset with three giraffes meandering about beneath the Baobab trees - and two of them look like they are about to try and make a fourth. Once I was mentally prepared, I popped the cap and smelled the liquid. Repulsive at first sniff, after a few thoughtful whiffs, it sort of smelled like a mixture of cola and foliage - a sort of semi-spicy leafy fragrance, with the smallest hint of urine and petroleum byproduct. Really hard to describe, but maybe that's what the African savanna smells like - foliage, piss, and oil. But the drink itself is even harder to describe. It is a perfect urine gold color - so much so, it would make a convincing looking sample if you left it in one of the little plastic urine specimen cups, and it comes across as a mix of cola, unsweetened cream soda, tonic water, forest greenery, cinnamon, and sugar. And, oddly enough, it tastes more like Coca-Cola than Pepsi. Much stranger than Pepsi Shiso, but with a lot less impact. 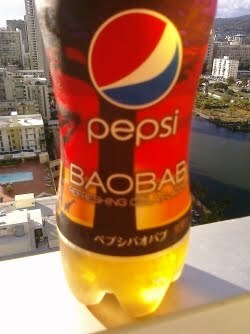 If Pepsi Shiso is any indication, I probably now have a pretty good idea what Baobab juice tastes like. It's not really something I'm going to go out of my way to ever find again. For now, the Pepsi Baobab bottle has gone up next to the Pepsi Shiso bottle, and I'm sure it will eventually be joined by whatever strange concoction Pepsi Japan comes up with next year, (and I wonder why these are only released in Japan). In the meantime, the blog can go back to its regularly scheduled programming until the next Pepsi Japan creation darkens my doorstep. 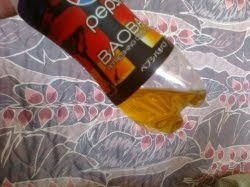 I quite liked the Pepsi Baobab. Tastes kind of like ginger ale. Where did you find some? [Voice of Homer's thoughts]: Mmm. Urine and petroleum byproduct.